Corner Bakery is one of those self-described 'bakery concept' restaurants, like Panera Bread. It's not a real bakery — it's just a fast food restaurant that bakes some of its own bread and claims to be 'healthier' than the competition. And it is not owned by your neighbors on the corner or even by a friend of a friend on the other side of town — it's owned by something called Roark Capital Group, a private equity firm that is "focused on leveraged buyout investments in middle-market companies." RCG reportedly has $3 billion in assets and also owns Arby's, Auntie Anne's, Cinnabon, Wingstop, and Atkins Nutritionals. A telling portfolio. Corporate restaurant chains like Corner Bakery wouldn't be so bad if they could at least be honest about themselves. But they know that if they were honest, they'd be out of business. For example, if they dropped the "Corner Bakery" name and used a more accurate one like "Corporate Bakery Concept" or "Fake Bakery" or "Roark Capital Group Cafe," no one would want to eat there. The executives know that such a restaurant would be considered undesirable by consumers — but instead of changing their product to make it desirable, they simply spend more money on marketing, to try to skew the perception. The entire business model is based on a kind of bait-and-switch scheme. They want to convince you to buy a product that they know you don't want, by making it seem like one you do. Notice the 'old' sepia photograph of a traditional-looking bakery interior with the generic phrase "Corner Bakery" superimposed on the glass. Obviously a digital fabrication. Their goal here is to associate themselves with a pleasing Rockwell-esque nostalgia that contemporary restaurant corporatism has in fact helped destroy. The real corner bakeries of the US don't exist anymore — because they have been supplanted by fake ones. This isn't entirely the fault of the corporate restauranteurs — they only offered the bait. It's the American consumer who's been dumb enough to bite. As a contrast, we should note that none of the largest fast food chains engage in this kind of thing. McDonalds, for instance, doesn't go around trying to convince you that it's the same local burger joint that the McDonalds brothers founded in 1940. The "I'm Lovin' It" campaign may have its own problems, but it is not intended to create a deceptive image or evoke nostalgia. Why does Corner Bakery feel the need to deny what it actually is? Here's a guess: guilt. And while we're on the subject of names, we might also examine "Roark Capital Group." The founder and current head of RCG, someone called Neal Aronson, named the company after Howard Roark, the main character of The Fountainhead, that novel written by libertarian pin-up girl Ayn Rand. 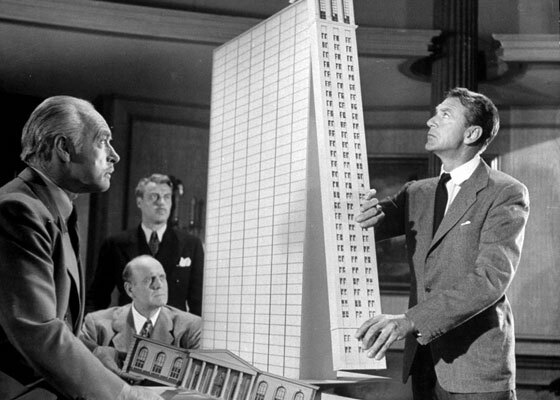 This is somewhat ironic because Roark — the character — was an architect who doggedly pursued his individualistic vision, divested himself of financial cares, and struggled to work to the highest-possible quality standards. CEO Aronson, on the other hand, peddles low-quality products through his junk chains, aspires to the maximum hoarding of cash, and shamelessly panders to popular taste. He's an anti-Roark (or a Gail Wynand, if we are to be precise). But we at Fakenation can sympathize with Mr. Aronson and understand why he chose that name for his company. After all, it would have been financial suicide to call it "Proud Slumlord Capital Group."